More Jotters! Wrapped Edges and End Papers. My friend Anita made a comment on yesterday’s jotter journal post about my edge-fraying problem. 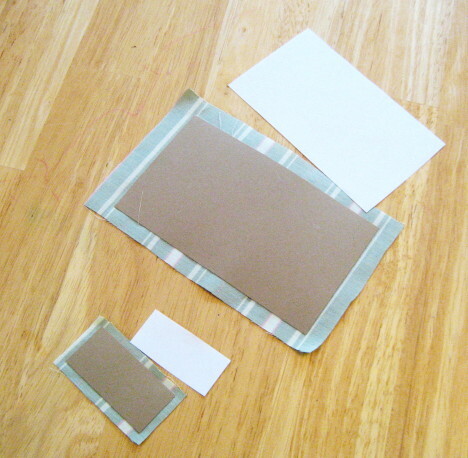 We both agreed that wrapping the edges of the fabric around the card stock would be a good solution. I wasn’t sure if it was worth the time to do that and include end papers since this is such a quick project. However, I decided to try it today and it worked beautifully! It really did not take much longer to do and I think it gives a much more finished look to the journals. So, in today’s experiment, I created two new little jotters. 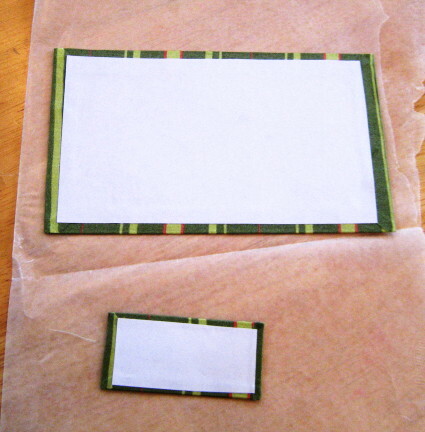 Both were done using my Tree Stripes fabric in cotton silk. It has a lovely sheen and gives a slightly fancier look to the finished product. 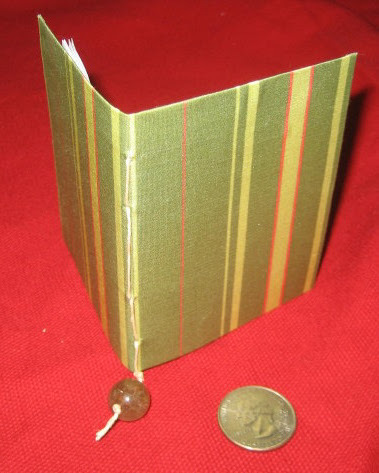 The first is about 3″ x 3.5″ and in addition to wrapping the fabric around the edges, I also sewed the pages in a bit differently, adding a large, decorative bead at the bottom for a little embellishment. 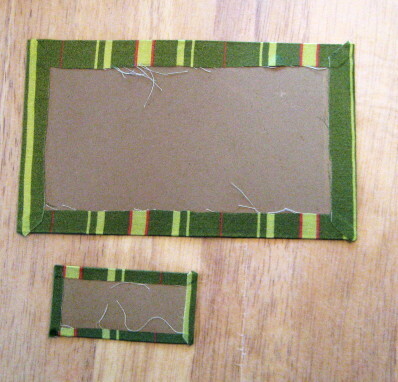 After gluing the card stock to the fabric, I trimmed the edges an prepared to glue them down. I also cut end papers to fit. What isn’t shown here is that I had to trim diagonally across the corners leaving about 1/8″ fabric so that when the edges were folded there wasn’t too much bulk. I glued the fabric edges down using my glue stick and after they dried a bit (under some waxed paper and a heavy book), I trimmed up the little bit of extra sticking out in each corner. Finally, I glued down the end papers, again using my glue stick and pressing it under some waxed paper and a heavy book to dry. The finished product! The quarter is in the photo for scale. The second was inspired by the work of Louise Thompson, an artist from New Zealand, who makes incredibly beautiful and often miniature leather-bound journals. Check out her sites – she has a blog as well as an Etsy shop. Her shop is under the name Bibliographica. 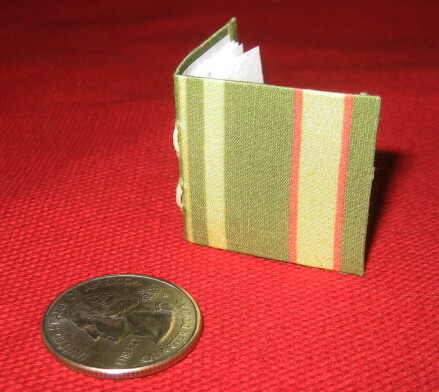 If you enjoy bookbinding at all or miniature things, you will really love it. 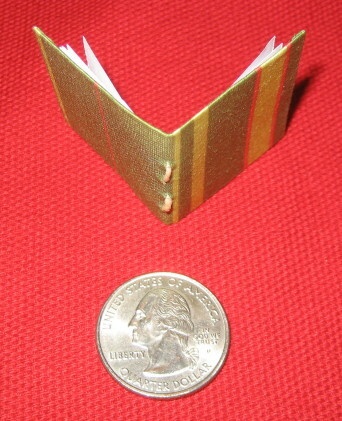 Anyway, my mini jotter is just 1 1/4 ” square. It was made using the same cotton silk fabric in the Tree Stripes print. NOTE: I did both of these earlier today off and on with interruptions from the kids, drying time, etc. It really was a quick project. I can see me doing lots more of these. Previous My first Jotter Journal Attempt!